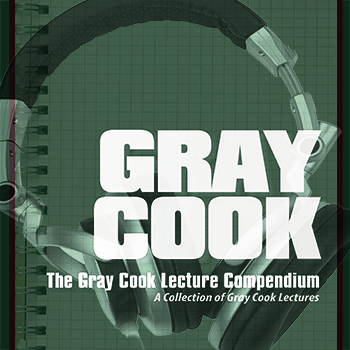 Today we begin a 10-week series in which Gray further develops the 10 movement principles he presented in Chapter 15 of his book, Movement. We’ll post a new segment each week on Tuesdays. This material was also covered in depth in his live workshop DVD, Applying the FMS Model. Principle 1: Separate painful movement patterns from dysfunctional movement patterns whenever possible to create clarity and perspective. Pain produces inconsistent movement perception and behavior. We should not exercise around or into pain hoping it will get better without first attempting to manage it systematically. The movement screen at its core is designed to capture pain and identify situations that should be properly evaluated prior to consideration for exercises, activities and conditioning programs. The movement assessment improves clinical perspectives by separating pain and dysfunction, and placing equal focus on movement dysfunction to manage regional­ interdependence. The Functional Movement Screen (FMS) separates pain by pretty much kicking out pain. If movement causes pain, the screen is over. The Selective Functional Movement Assessment (SFMA)—the medical counterpart of the movement screen—picks up where the movement screen ends. There are two situations. If someone already knows that movement causes pain, we go straight to a medical situation where the SFMA can be part of the overall evaluation tool. The FMS, on the other hand, is basically targeted toward people who are asymptomatic and don’t have any pain, but wish to have a little more specific orientation or profiling prior to training. A lot of us don’t achieve our training goals. Sometimes it doesn’t have anything to do with our work or our efforts. Maybe we’re not aiming in the right direction. The movement screen adjusts our aim, but in the event it uncovers pain, it also requires that we need to maybe figure out a little more about it. Pain is something that is often coupled with movement. Since we’ve been training for the last 30 years under the adage ‘no pain, no gain,’ it’s hard to hear a guy who’s a strength coach, physical therapist or sports enthusiast being as vocal as I am about separating out the pain. It’s what I’ve learned about motor learning. It’s what I’ve learned through clinical practice for quite some time that tells me you’re not going to meet a lot of your goals by working around the pain. It’s better to take the time to understand it. Now, I’m not talking about skipping a workout on a day when your muscles are sore or tight, as I stated early on in Athletic Body in Balance. The pain we’re talking about is reproducible. It’s consistent and it’s usually localized around a joint. Joint pain, unlike muscle soreness, is a legitimate red flag. Muscle soreness usually changes when an appropriate warm-up, foam roll or flexibility effort is performed. Sometimes the best remedy for muscle soreness from a good workout or athletic competition is actually to get moving again. That’s not what we’re talking about. We’re talking about sharp stabbing pain, dull aching pain or pain associated with redness and swelling. If you push against that type of pain, it’s going to push back. It’s going to push back harder and it’s going to win. We need a systematic way to separate the pain and movement, so we know the type of problem. Wow, you must think I have a crystal ball! I have no idea what’s causing your back pain. There is no preset program to undo what is happening to you. Your back pain could be a completely different issue than another person who’s getting ready to ask the next question three minutes from now. It’s a really inappropriate question if you think about it. I can ask this if you’re a real estate agent, ‘Hey, what should I sell my house for?’ What’s the next question? You need more information! That’s a pretty dumb question. It’s not even an answer you want to hear because it’s going to be wrong in a million and one cases. The first order of business is to subscribe to and use systems that fit this principle. I designed the FMS and the SFMA specifically to adhere to this principle. I didn’t design this principle to work with those tools. I designed those tools because I believe in this principle. Continue with Part Two, here, and to continue your professional study, please consider the book, Movement and the live workshop DVD, Applying the FMS Model.